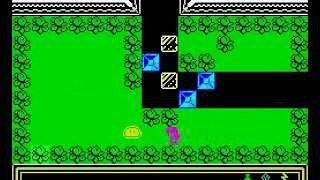 Chaos was a classic turn-based strategy game (featuring wizards) for the ZX Spectrum home computer created by Julian Gollop. It was originally released by Games Workshop in 1985, and like many of his games, this one had a cult following during the 80's and inspired many other games such as Laser Squad and the Rebelstar series. Turn-based games are rarely released these days, although the ones that are released still have a cult following, I guess. The most recent one I played was World in Conflict on my PC which I found a tad too complicated to get to grips with. Somehow, I still prefer the simplicity of the old 80's games. 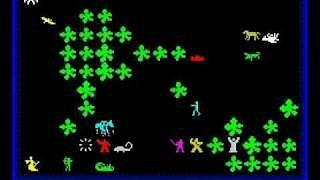 The video review above tells you all you need to know about the Chaos game and is well worth spending seven and a half minutes watching if you want to bring back some childhood memories. Or maybe you don't remember it at all, but just want to see what all the fuss was about! Chaos received an 8/10 rating in issue 16 of CRASH! magazine and Sinclair User gave it 4 out of 5 stars. The idea for the game came from a board game by Game Workshop called Warlock. Julian Gollop created a card game in 1982 which was inspired by Warlock, and the Chaos computer game was based on this. The board used in the board game became the tiled map in the video game. "Chaoscomputergame" by Source. Licensed under Fair use via Wikipedia. A sequel entitled Lords of Chaos was released in 1990. This was also created by Julian Gollop and released by Blade Software. Unlike its predecessor, the game was also released for other formats including the Amstrad CPC464, C64, Atari ST and Commodore Amiga, although the 16-bit version was released until August 1991. You may remember that games for the 16-bits were often twice the price of the 8-bit version. Lords of Chaos retailed for £9.95 on the 8-bits and £19.95 for the 16-bits. The Amiga disk version was £24.95. Lords of Chaos was eventually released into the public domain by Julian Gollop after the popularity of these computers declined. Was the sequel any good? Well, I've never played the game, but it certainly received a warm reception from the critics. Your Sinclair gave a 90% rating with Crash! magazine awarding a less generous 80%. However, the readers of Crash! voted Lords of Chaos the "Best Adventure Game of the Year".